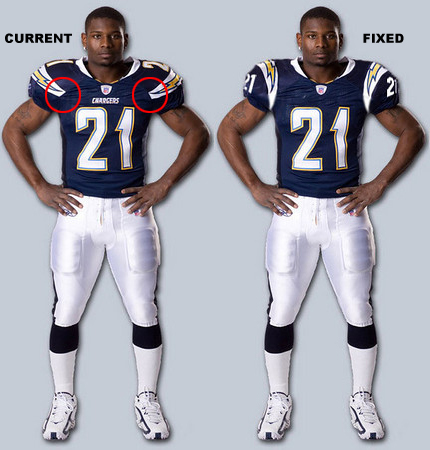 New Jerseys for the Chargers? I saw somebody posted this on reddit, and aside from the fact that they used LT as the Charger in the photo… I think it’s great. (nothing against LT, he’s just not on the team right now) I mean, doesn’t the ‘fixed’ version look a billion times cleaner? I’m into it. Even though it’ll never happen. Speak, lobsters. Tell me your thoughts. This entry was posted in Football, NFL and tagged Chargers, chargers jersey, chargers uni, chargers uni fix, chargers uniform. Bookmark the permalink.